and Dennis Power, chief of staff, county board of legislators. 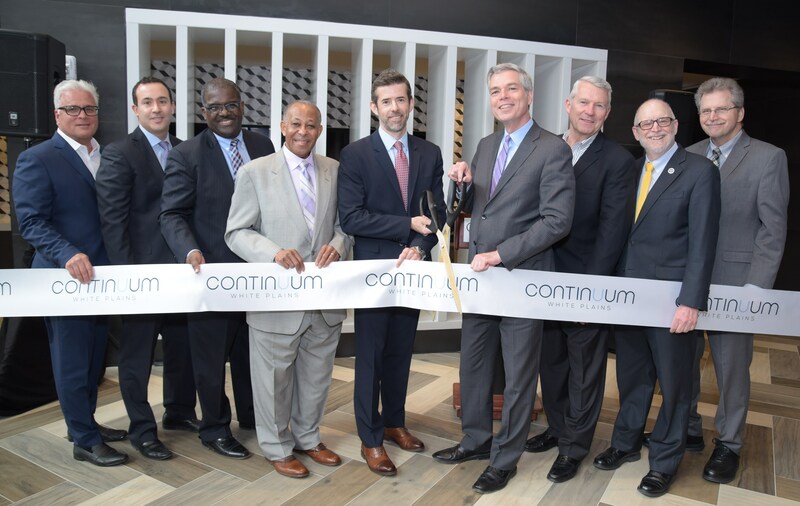 WHITE PLAINS, NY The transformation of the Transit District took a step forward with the grand opening of the first phase of Continuum, a 16-story transit-oriented development featuring 288 rental residences, amenities and 3,000 s/f of ground floor retail space. Located at 55 Bank St., Continuum is adjacent to the White Plains Metro-North station, which is slated to undergo a $92 million renovation. In six months since the start of pre-leasing Continuum is 50% leased. “We are very pleased at the tremendous leasing activity we have experienced over the past several months. Continuum offers an unbeatable combination of luxury residences, full array of top quality amenities and a convenient location that’s only steps from the Metro-North train station,” said Brian Barry, SVP of LCOR, the developer of the project. The builder is Cappelli/LRC Construction and the architect is SLCE Architects. “Continuum is an exciting addition to the White Plains Transit District and the city as a whole. I am particularly pleased that the project includes a 20% affordable component,” said mayor Tom Roach. Westchester County deputy county executive Ken Jenkins said, “Today’s world requires safe, secure and affordable housing that is centrally located to all services that residents need. The Continuum provides just that. With its close proximity to the White Plains transit district, and entire downtown area, this project is a boon for White Plains and Westchester County.” In 2015, LCOR received financial incentives from the Westchester County Industrial Development Agency (IDA) for development of Continuum. The Continuum’s residences feature the finest modern finishes and expansive windows offering spectacular panoramic views of White Plans and even the Manhattan skyline. The studios, which range from 523 to 587 square feet, are priced from $2,120 to $2,380 per month. The one-bedroom residences range in size from 710 to 732 s/f with monthly rents ranging from $2,680 to $3,020. The two-bedroom residences range in size from 1,184 to 1,256 s/f and are priced from $3,845 to $4,220 per month. This project also includes 57 units of affordable housing, 20% of the total apartments. Residents of Continuum enjoy an impressive array of amenities from the grand two-story lobby with 24-hour concierge to a sophisticated Sky Lounge that includes a Club Room with a full complement of entertainment options including a fireplace, kitchen, private dining area and multiple smart TVs. An adjacent roof-top deck has an open-air terrace, fire pit and spectacular views of Manhattan. Residents can also enjoy a beautifully designed sundeck terrace with swimming pool, plantings, outdoor furnishings and BBQ grills. There is also a state-of-the-art fitness club, business center, children’s playroom and game room/simulator. Continuum is a key component in the Bank Street Redevelopment Area created by the City of White Plains. Previously a municipal parking lot, LCOR purchased the property from the City. The second phase of the $250 million project, which consists of another 16-story tower with 273 residences and ground-floor retail, is scheduled to break ground early next year.